Premium feature: images can be saved from a webpage to diigo online library via IE or firefox toolbar. 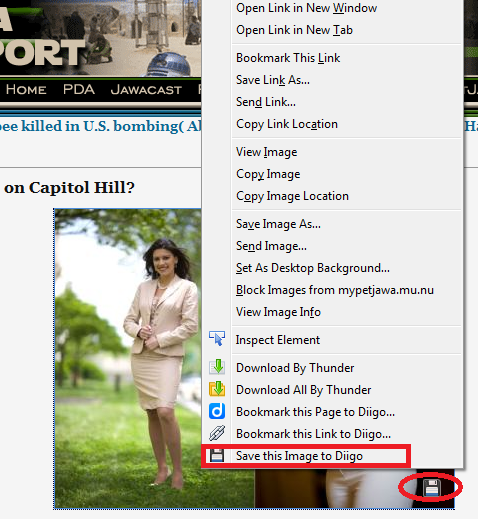 1) Just right-click on the picture when you surf on the internet and choose " save image to Diigo" in the pop-up menu. Or clicking on the disk icon, the image will be uploaded to your library automatically. b "Edit" allows you to add tags or share the image item to a list or group. 3) The saved image also plays a part of the whole bookmark. As you can see,it shows up as annotation together with the original URl in library.